Renana, a 3-week-old Sand Cat, is seen at the Ramat Gan Safari near Tel Aviv, Israel, on Tuesday, August 9, 2011. Safari spokeswoman Sagit Horowitz said its the first successful birth of a Sand Cat at the Israeli zoo. Israel -- Zoo Borns reported today “a rare Sand Cat Kitten was born at Israel's Safari Zoo.” This three-week-old kitten marks Safari Zoo’s first successful sand cat birth. 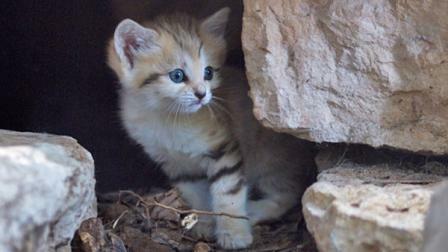 Officials hope the kitten will join the country’s sand cat Breeding Program and help reintroduce sand cats to the wild. Three weeks ago Rotem, the kitten’s mother, chose to remain outside instead of going into her night chamber at the end of the day. The following night, she gave birth to the tiny kitten in the den’s outdoor enclosure. Sand cats are listed as near threatened by the IUCN. These small wild cats were once plentiful in the dunes of Israel but are now extinct in the region. They can be found in other areas of the Asian and African deserts. While sand cats will drink water if available, they can survive for months on the water provided from their food.